Peter Greene, blogging machine that he is, points us to a new video from the fine reformy folks at the American Enterprise Institute. Greene dispatches much of Michael Q. McShane's perambulating argument in his post, so I won't repeat it here. Take a minute or two to read him instead; it's worth it. I'll also point you to this paper by Bruce Baker for a summary of the "sizable and growing body of rigorous empirical literature [that] validates that state school finance reforms can have substantive, positive effects on student outcomes, including reductions in outcome disparities or increases in overall outcome levels." McShane's contention that we have spent too much money on education and we don't have results to show for it is contradicted by empirical evidence. Did you know that Americans without a high school diploma, compared to college graduates, are three times more likely to be unemployed, and even those with high school diplomas average fifty percent less in annual income than those with college degrees? But the gap between the educational “haves” and “have-nots” is vast and only growing wider. Take Jennifer, a fourth grader born into the poorest 20 percent. Without a college degree, she only has a 5 percent chance of reaching the top, compared to a 45 percent chance of staying in poverty. With a college degree, she’s more likely to make it to the top quintile than she is to remain in the bottom. A quality education makes an enormous difference. Do the hard-working people who clean that building every day need a college degree? Perhaps, following the taping of this rather exhausting video, Mike felt the need for some refreshment. After he finished his lunch, who do you suppose washed his dishes? Who picked the arugula for his salad? Who mows the lawn outside AEI's offices? Who stocks the shelves at the mall where Mike buys his denim shirts? There are millions of people in America who do hard, often dirty, sometimes dangerous jobs that are necessary. As Barbara Ehrenreich documents in her indispensable Nickled and Dimed, these people are the backbone of the American workforce -- and yet they barely make enough to survive, let alone thrive. McShane would have us believe that giving the Jennifers of the world a chance to break out of the mean and nasty life of the working poor is the solution to our income inequity. The problem is that if we send all of the Jennifers to college, it won't change the needs of the American economy. We'd still need people to empty the bedpans and load the garbage trucks and pick the vegetables and sweep the floors and do all of the other back-breaking but necessary work America needs to get done. I am all for social mobility: Jennifer should not be consigned to a life of working poverty simply because her parents were. But somebody has to wash Mike's dishes; somebody has to clean Mike's office. Let's at least be honest enough to admit this. We can, of course, have an argument as to whether reforminess actually fosters socioeconomic mobility. Personally, I think anyone who believes that education "choice," in its current incarnation, will help more kids break into the middle class is fooling themselves. I've often remarked on how charter schools love to put on airs of preppydom: it's as if the reformies believe some school uniforms and a few college pennants on the walls will magically wipe away hundreds of years of institutional racism and systemic income inequity. Sorry, but I just don't see how a "no excuses" style of schooling does anything to help children living in poverty acquire the social capital they need to advance up the capitalist ladder. But even if I'm wrong, reforminess doesn't address the larger problem: people doing necessary work are not sharing in the productivity gains of our economic system, largely because most of those gains have accumulated at the very top. The fundamental flaw in the reformy education argument is that it conflates social mobility with income inequity. These are separate issues, and while reforminess most likely won't increase social mobility, it certainly won't solve income inequity. Until that happy day when we have robots doing all the difficult work for us (dystopian fears fueled by science fiction aside), we need millions of people doing millions of tough, dirty, hazardous jobs. These people don't require college degrees: they need better-than-living wages, cheap health care, good housing, safe communities, and, yes, good educational opportunities so their children can advance if they so desire. Of course, that means others who are higher up in the economic order might see their children drop down. But you know something? Maybe those people wouldn't worry so much about that if they knew that their children, so long as they work hard and play by the rules, will never have to worry about being able to afford to go to the doctor, will always have a good roof over their heads, and can retire at an age where they can still enjoy life and spend time with their families and in pursuits other than work. Maybe if the stakes weren't so high, middle class parents wouldn't feel getting their children into college, whether those children had the talent and desire or not, was a matter of life and death. We have enough money to do this. We can take care of everyone and still have plenty left over to incentivize capitalists to do their thing. But as long as our national conversation on education is dominated by people who, willingly or otherwise, can't see the difference between social mobility and income inequity, we will never muster the political will to do what needs to be done. Hate to admit it, but you have to be of a "certain age" to get the joke. The Urban Hope Act, which will greatly expand charter school enrollment in Camden, overwhelmingly passed the Senate this week following Governor Chris Christie's conditional veto. The bill now heads to the Assembly; if it passes, the Mastery and Uncommon charter chains will be allowed to use existing CCPS facilities and revenues to grow their presence in Camden, inevitably leading to the closure of many of the city's public schools. Given what we know about charter schools in New Jersey, the Urban Hope Act is unlikely to work. Rutgers professor Dr. Julia Sass Rubin, a founding member of SOSNJ*, has extensively outlined much of the evidence I'll present here. Her analysis examined both Mastery and Uncommon; my quick rundown focuses only on Uncommon, as there is no New Jersey data yet available on Mastery. 1) The charter management organizations (CMOs) coming to Camden under UHA do not currently teach as many students in economic disadvantage (ED) as the neighboring public schools. 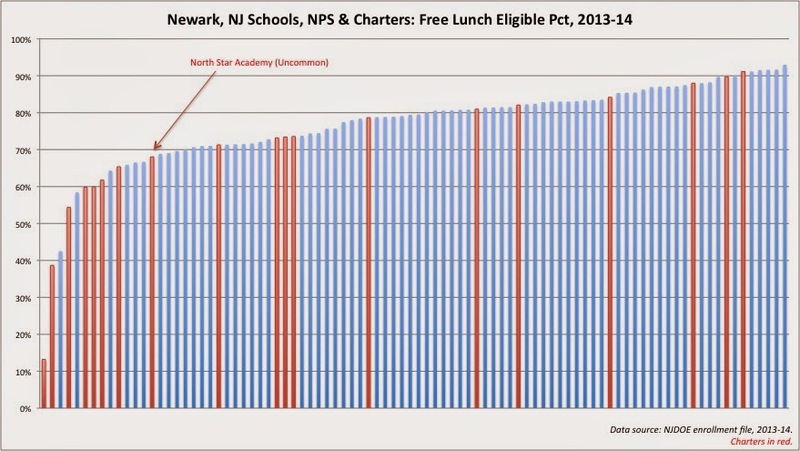 The evidence is clear: North Star Academy, the Newark branch of the Uncommon CMO, does not teach nearly as many children who qualify for free lunch (the best proxy measure we have for economic disadvantage) as the NPS schools. You may hear some argue that North Star comes closer to NPS when we measure ED with free or reduced-price lunch status, but's that's because RPL is at 185% of the poverty line, while FL is at 130% percent. In a city like Newark -- or Camden -- RPL is a measure of relative economic advantage. 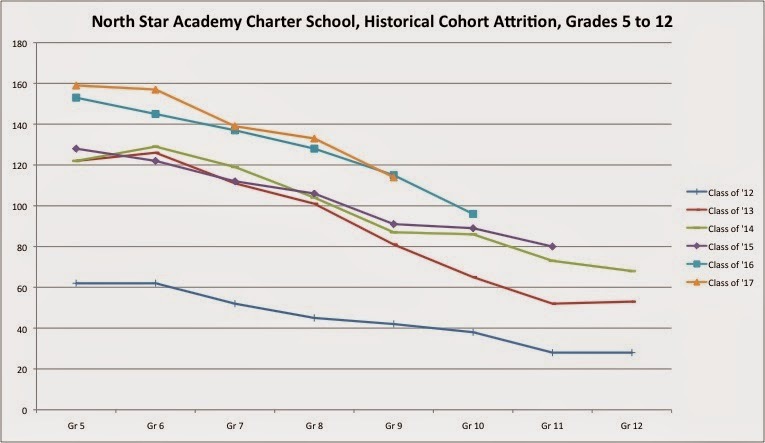 2) There is no evidence these charter schools "beat the odds" when educating children in economic disadvantage. From one of the analyses Bruce Baker and I did of "One Newark," the school restructuring plan for that city. Yes, North Star gets good test scores -- but it closely follows the trend of rising test scores correlating to reduced FL percentages. 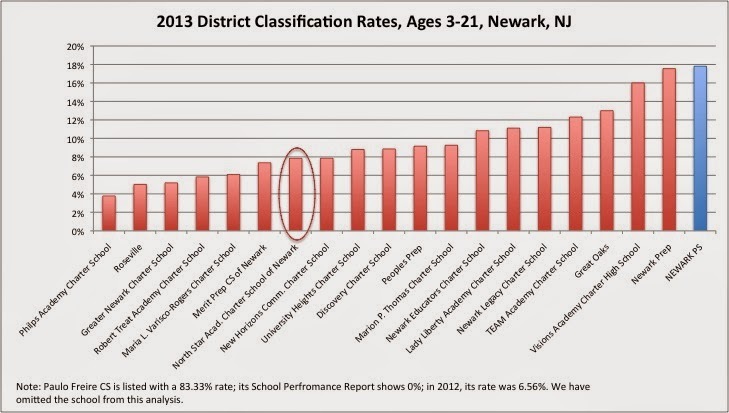 This strongly suggests North Star gets its gains at least in part from a "peer effect," which cannot be replicated at a large scale: not every school in Newark or Camden can have below average student poverty. 3) North Star engages in patterns of significant student cohort attrition. 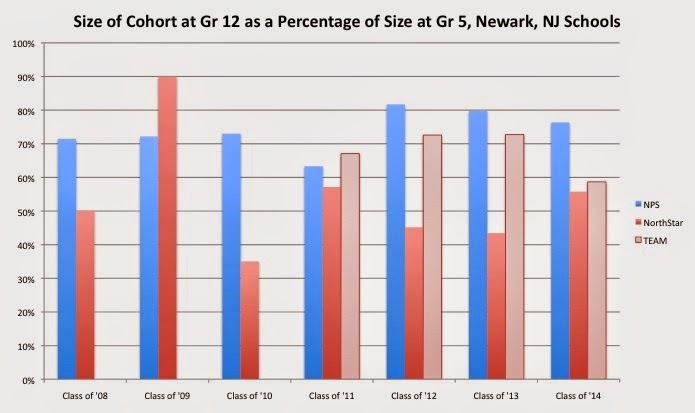 As each cohort moves through North Star, it sheds students -- significant numbers of students. While some undoubtedly move outside the district, it is likely many return to NPS schools. These patterns of attrition, however, are not nearly as pronounced within NPS. For the last five years, each of NPS's Grade 12 student cohorts was proportionately larger than North Star's as judged by its size in Grade 5. We don't know how this plays out when using individual student data, but the evidence strongly suggests North Star sheds more students proportionately than NPS. 4) North Star does not educate nearly as many children with special education needs as NPS. Proportionately, North Star doesn't even educate half of the special education students that NPS does. If students with special needs won't be served by the charters, where will they go to school? Additionally, it's clear that the special education students charters do enroll have low-cost needs. Which suggests the higher-cost students -- those on autism spectrum, with serious health impairments, with emotional disturbances, etc. -- will be in CCPS, even as the UHA charters take 95% of the funds per student from the district. The UHA is setting up a fiscal disaster for Camden: it will likely leave students with the most costly needs in the public schools while disproportionately diverting the funds needed to educate them into the charters. Senator Sweeney says, "We may be wrong" when he endorses the Urban Hope Act. Senator, with all due respect, the evidence we have suggests not that you "may" be wrong; instead, you "likely" are wrong. The Urban Hope Act is bad policy. It should not be approved by the Assembly. * Full disclosure: I am currently doing research work for SOSNJ. We're fast approaching early November, which means the New Jersey Education Association's annual convention will be here soon. And that means the foolish arguments against the convention will also be upon us. Chris Christie once said that if teachers "cared about learning," they "would not be down there in Atlantic City having a party — because that’s what it is." Of course, his education commissioners have also attended this "party" -- but that was only so they could shamelessly argue that poverty doesn't matter in education. Cami Anderson, State Superintendent in Newark, stated that crime went up during the convention with no proof whatsoever. As Bob Braun pointed out at the time, Anderson's statement speaks volumes as to how she views the students in her charge. - There is no reason to believe, and no evidence to support, the idea that taking two days off in November is any worse than taking two days off in any other school month. If we had any evidence that more continuous days of school are better than interspersing them with days off, it would call into question the entire idea of school holidays. In other words: if two days off in November is so bad, why have a spring break? Why have a holiday break? Why have weekends? For that matter, why have the kids go home every night? - The number of days in the school year is set by statute, so if you don't take two days off in November, you cut back the days at the beginning or end of the year. Schools have to be open 180 days to receive state aid (and that's the national norm). If districts cancel the convention, they will simply end the school year two days earlier, or start the year two days later. Does anyone really think that will make the slightest difference in student learning? - If teachers are in school for two extra days, they should be compensated. Nobody should be forced to work two extra days for free, especially without the benefit of negotiations. So if you get rid of the convention and extend the school year by two days, you have to have a plan to come up with more money to pay teachers for the additional time. Anyone have that plan ready to go? - There's no reason to believe more teachers will come to the convention if it's held during the summer or on a weekend. Last year, 30,000 teachers attended the convention; that's certainly not even close to all of the teaching corps. Considering, however, that it takes hours to drive to Atlantic City from the northern part of the state, and that teachers are not compensated for their travel, it's still a pretty impressive number. This is only conjecture on my part, but I'm guessing one of the primary barriers to more teachers attending the convention is child care. A teacher with her own kids has to find someone to watch them while she's away, because her kids' school is closed. Moving the convention to the summer or a weekend doesn't do much to address the personal cost or child care worries of teachers (and I wouldn't presume spouses are always available to help at other times -- or that all teachers with kids are married). - The convention is still valuable, even if not every teacher goes. It only takes one teacher in a building to act as a conduit of information and training acquired at the convention. In other professions, firms don't feel like they need to send all of their staff to a convention for it to have worth for the entire group; they expect professionals who attend a convention to share what they learned with their colleagues. It should be no different for teachers. - Believe it or not, teachers are adult human beings who have every right to socialize and indulge in adult pleasures on their own time. I detect a bit of a puritanical streak in some of the criticisms of the convention. When the odious James O'Keefe made a sleazy gotcha video a few years ago at the convention, he was sending out a not-very-subtle message: teachers who drink and flirt and gamble are not to be trusted (even as the rest of America drinks and flirts and gambles). When Christie called the convention a "party," he reinforced his meme of the "good" teacher being a saint. Only "bad" teachers would dare to have some fun in Atlantic City when the work of the convention was finished (BTW: given the recent troubles of AC, is it really a good idea to further the economic woes of the city by canceling one of its biggest events?). Yes, during the day, the convention is professional development. Later, at night, it's fun (or so I hear -- I've never stayed over, wet noodle that I am). So what? Does that really bother anyone? If so, grow up. As bad as Governor Chris Christie has been for New Jersey's schools, Governor Tom Corbett has been far, far worse for Pennsylvania's. Under Corbett, "cyber charters" have proliferated, even though all the evidence shows they are little better than pits where taxpayers throw their money, enriching the operators and denying students proper educations. Corbett brought us Vahan Gureghian, a school privatizing pirate who all but bankrupted the Chester-Uplands school district, thanks to Pennsylvania's insane special education funding policies. Now Gureghian has come to Camden on this side of the Delaware, thanks to the indifference of the South Jersey Democratic machine. Corbett has actively abetted the willful destruction of the Philadelphia school system. But his commitment to inequality has spread all over the state, and Allentown, Reading, and other communities are suffering under his draconian education cuts. Back in 2012, Corbett cut $8.4 million - over 15% - from York's budget. The predictable happened: cuts to the arts, cuts to student services, increased class sizes, and so on. I did a quadratic trend line to get things a little tighter (no, it doesn't matter, and you're a geek...). Then I highlighted all the schools in York, charters and publics. Big surprise: everyone is pretty much where you'd expect them to be. The elementary schools do a little better than prediction; the secondaries do a little worse. And the charters are right where we'd expect. Considering that most of York, PA's schools have student populations where 80 percent or more of the children are in economic disadvantage, the test-based outcomes of the school district are hardly surprising. 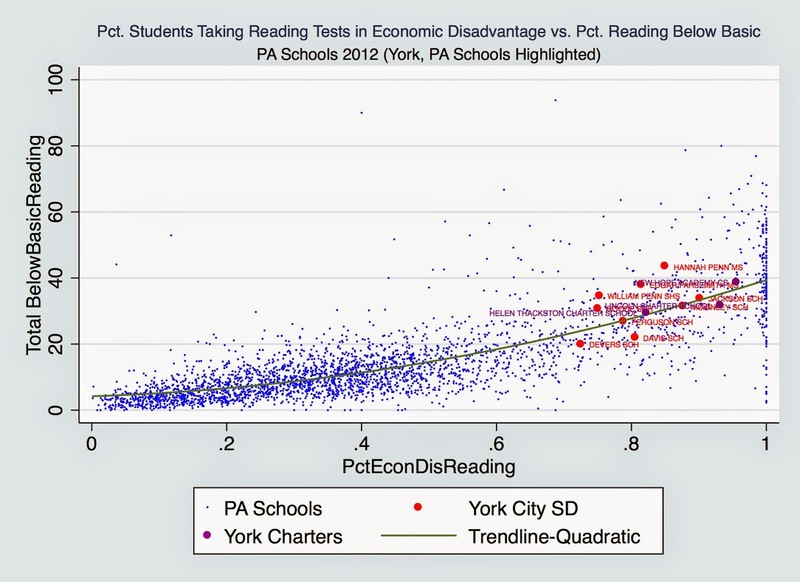 York, PA does not have a school effectiveness problem: it has an economic inequality problem. The schools are reflecting the reality of life for children in York, PA; anyone who argues otherwise is being willingly obtuse. So here's the play: Tom Corbett keeps taxes low on the commonwealth's rich, so any chance at public works programs or other sorts of economic stimulus are shot. He then cuts the public school budgets in cities that are suffering under his failed policies of tax cuts for corporations. Afterward, he gets his Secretary of Education to send in a known education privatizer to govern York's schools, under the pretense that they are now in "Moderate Financial Recovery Status." A crowd of York City School District employees and other community members rallied before a school board meeting Wednesday, asking board members to "say no" to bringing in charter operators to run district schools. The school board has been exploring that possibility, an option under its financial recovery plan. Those involved with the rally included the employee unions, the York NAACP, and York Concerned Clergy. The Rev. Aaron Willford, a former member of the city school board, said parents he's spoken to aren't in favor of bringing in charter operators, but they don't know where to turn. He said he wants to stand up for them. "The main message is to say no to those who (want) to charterize schools," he said, adding that children shouldn't be "guinea pigs." Clovis Gallon, a teacher and union representative, said Gov. Tom Corbett needs to restore funding for education, saying the district had many more programs when he attended. 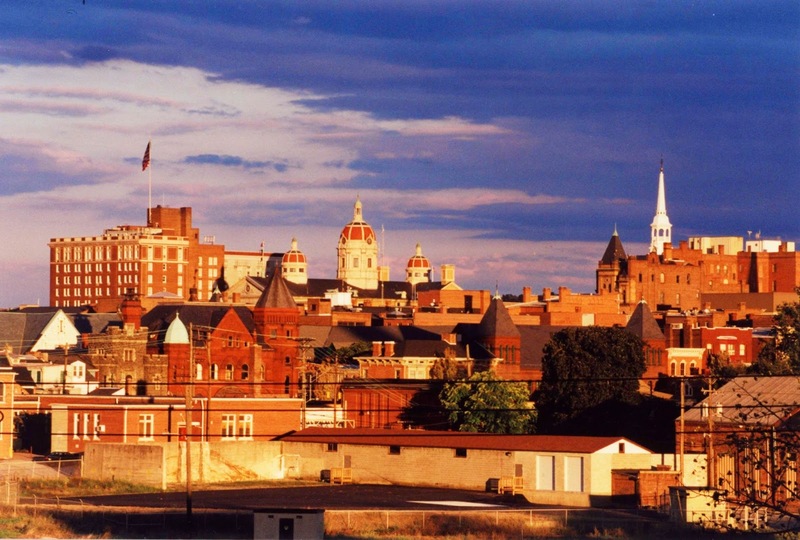 The city district has more challenges, but is expected to meet the same standards as others. "I don't know if parents actually understand what's happening," he said, adding that if charter operators took over, teachers and staff would be lose their jobs and have to reapply. The salaries at schools run by the operators likely wouldn't be comparable to neighboring districts, he said. Mr. Gallon remembers a time when his schools had many more programs. Of course, if they still did, parents wouldn't feel, as Rev Willford says, like "they don't know where to turn." See how it works? Gut the public schools under a shock-doctrine falsehood of "we don't have the money!" and the public then feels it has no choice but to take the charter school bread crumbs Tom Corbett throws their way. David Meckley, the chief recovery officer for the district, issued a statement saying three options are being considered: the internal reform plan, or moving forward with either Charter Schools USA or Mosaica Education. Benchmarks in areas such as academics, safety and parent involvement are being reviewed for both companies and the district so a decision will be based on facts, he said. "We need to ask ourselves what solution will improve the educational lives of these students and what do we have to do to make that happen now," the statement says. "Based on facts"?! If David Meckley gave a flying fig about "facts," he wouldn't have spent even two seconds considering either Charter Schools USA or Mosaica. For example, Winthrop Charter in Riverview may struggle to balance its budget this year thanks to a $2 million rent payment to CUSA/Red Apple Development. The payment will equate to approximately 23% of its budget, even though CUSA CEO Jon Hage has been quoted as saying charter school rent should not exceed 20%. Similar figures exist for the last of the triumvirate for CSUSA, Henderson Hammock Charter School in Citrus Park which opened in 2012. Their lease fees are the largest of the three, $1,170,000 for 2012-3013 and $1,193,400 for 2013-2014! Unfortunately, students attending schools managed by Mosaica have not seen their educational trajectories rise with the management company’s revenue. Instead, Mosaica’s students around the country consistently underperform their peers. Mirroring the organization’s national record, Mosiaca’s local charter school, Atlanta Preparatory Academy (APA), is one of Georgia’s worst performing schools on annual exams, with students in all grades scoring in the bottom 20% statewide. The school is currently up for charter renewal and has requested that the Atlanta Board of Education grant it a five-year charter extension. During the December 2012 school board meeting, Mr. Allen Mueller, Executive Director of Innovation for Atlanta Public Schools (APS), recommended that the Board of Education decline to renew APA’s charter, citing low academic achievement and concerns about the school’s financial independence from Mosaica. District 1 Board of Education representative, Ms. Brenda Muhammad, quickly rebuffed this recommendation and advocated extending the school’s charter for an additional five years. The Board ultimately voted to delay any decisions until its January 2013 meeting. A comprehensive analysis conducted by Arizona State University lists the first 36 schools founded by Mosaica since it began operating in 1997. Twenty seven of those schools have since been shut down by local authorizers or have extricated themselves from Mosaica’s management. When Mosaica couldn't make money in Muskegon Heights, MI, the charter chain cut and ran. Expect the same in York if this horrible "charterized" district idea ever comes to pass. And it will pass, if Tom Corbett has his way. 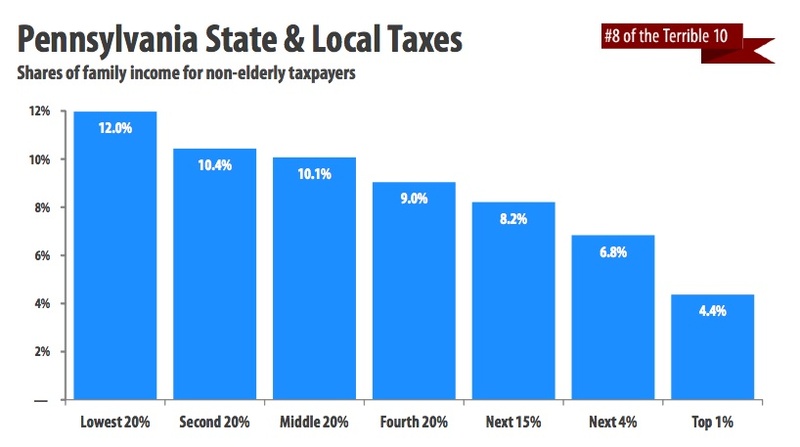 Like any master grifter, Corbett has been playing the long con: cut taxes for the wealthy, starve the schools while claiming budgetary poverty, declare an educational emergency, and then let edu-vultures like CSUSA & Mosaica pick at the bones of a decimated school system. The only chance the good people of York -- and all of Pennsylvania -- have of saving their schools from Tom Corbett and his minions is a concerted and united stand against the brazen privatization of our public schools. York, Pa. (Sept. 19, 2014) – York Concerned Clergy and the NAACP will stand with the city's teachers, education workers, and parents to speak out against a planned charter takeover of the York City School District before charter CEOs present their proposals to the Community Education Council next week. Speakers will also highlight some troubling details about the two leading for-profit charter corporations competing to take over every one of York City's public schools – Mosaica Education, Inc. and Charters USA. 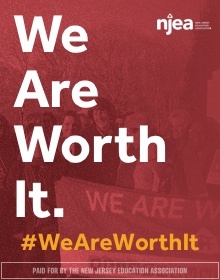 What: Rally before Community Charter School Presentation Where: Hannah Penn K-8 School, 415 E Boundary Ave, York When: Wednesday, Sept. 24, 2014, 5:30-6:30 p.m. Details: The rally will occur outside the school cafeteria. Participants will then attend the Community Education Council meeting and Charter School Presentation beginning at 6:30 p.m.
Stay strong, York. If you win, we all win. The White Rose City. How's the beer? 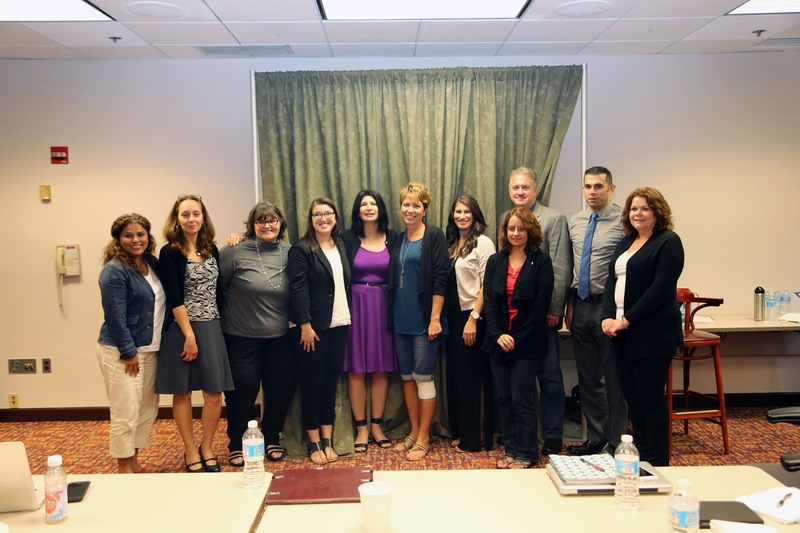 I was going to write about the meeting I and other New Jersey teacher-bloggers had with Lily Eskelsen Garcia, the new president of the National Education Association, last weekend. But Marie Corfield -- see here and here -- and Ani McHugh have done such a good job documenting the event that I really don't think I can add much of value. Here's a photo we took at the end of the event. Do you see a problem? I must confess: I didn't, until I got home and discussed the event with my wife. I know some of the people in this picture very well; others I met for the first time. So I won't claim to know how everyone here identifies themselves, but I do think it's fair to say that there aren't enough people of color in this picture. I suppose one could argue that this was a blogger event, but the truth is not everyone here is strictly a blogger. I suppose one could argue that this was for NJEA members, but the truth here is not everyone here is a member (even if all are sympathetic to the causes of public education and labor organization). So there should have been some more people of color here, and I should have been able to see past my privilege to recognize the problem immediately. That's on me, and no one else. Part of "unpacking your privilege" is admitting you're a human being and sometimes you screw up, even if you think your intentions are good. So I appreciate people bringing this up; I will do better in the future. Given the toxic atmospheres that have been created in state-run districts, it's completely understandable that some teachers who might want to try blogging would be reluctant to do so. Members of teachers unions should be told that their right to free expression will be protected by their associations (and yes, we're all professionals -- we know how to protect our students and their families and still make meaningful commentary on education issues). It was Gov. Chris Christie who unilaterally instituted New Jersey’s salary limits on school superintendents, and it will likely be governor who either ends or extends them when the caps expire in 2016. Christie yesterday wasn’t much showing his hand, first deriding educators who complain about their pay and then placing the responsibility on an unexpected source. 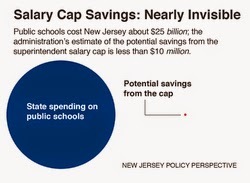 Then came the accusation: “Remember, the superintendent salary cap was an idea of the New Jersey Education Association. Maybe you should go ask them." But while none of that was particularly new for a governor who has stood by the pay limits since they were imposed in 2011, the NJEA comment certainly caught a few people by surprise. What the governor was referring to was unclear, although his limits came at roughly the same time he was pressing teachers to agree to pay freezes in the face of steep state aid cuts. Efforts to seek fuller explanation from Christie’s office yesterday were unsuccessful. Of course they were: isn't it enough that Chris Christie said it? What do you want, actual proof or something? The superintendent pay caps were always a terrible idea, and everyone with half a brain in their head knew it when the Christie proposed them. State Senator David Wolfe, the Republican deputy minority leader (and a man I respect), has already conceded that something has to be done to address the talent drain Christie's caps have caused. When normal politicians lose the leaders of their own parties, they tend to rethink their positions. But not Chris Christie: that would require admitting that maybe he was wrong about something, and that can never, ever be allowed to happen. So even though Christie repeatedly crowed about the caps back in 2010, and said competitive wages for superintendents were "...abuses that have been permitted for too long at the expense of our children’s education," he can't possibly admit now that he was just dead wrong. 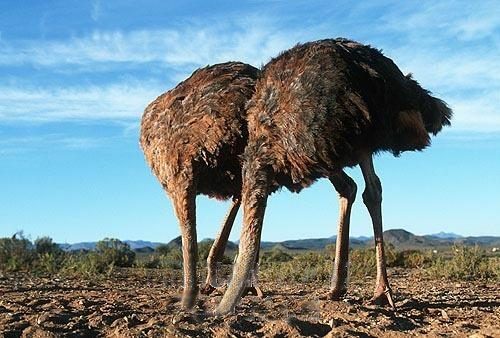 Instead, Christie absurdly blames, of all organizations, the teachers union. It's like a reflex with him: if anything goes wrong, blame the NJEA. If he ever becomes president, I'm sure he'll claim Vladimir Putin is a dues-paying member. Let's hope the press makes Chris Christie run on his record; if he does, there isn't a chance he will win the presidency. But, of course, being a failed governor didn't stop others from reaching the White House when the media gave them a free pass. Why Won't @NJSenatePres Sweeney Allow a Transparent Debate About Charter Schools? Senate President Stephen Sweeney is poised to pass S2264, legislation that amends the 2013 Urban Hope Act in order to accommodate illegally approved renaissance charter schools in Camden. Senator Sweeney is bringing this legislation to a full Senate vote on Monday, September 22, without first introducing it in committee. This legislation was already snuck through the Legislature once in late June. “The handwriting is on the wall,” said Susan Cauldwell, Executive Director of Save Our Schools NJ Community Organizing. “The people of New Jersey deserve more transparency and accountability from their elected officials, especially when our children’s futures are at stake,” Ms. Cauldwell added. Think whatever you want about Camden's renaissance charter schools. But how can anyone think it's a good idea to ram through a charter school bill with a voice vote and without the benefit of public committee hearings? I understand that this is South Jersey, and whatever George Norcross wants, George Norcross gets. But can't we at least pretend we're in a transparent democracy? Can't we at least give the people of Camden, who have been stripped of their right to autonomy, a chance to speak up before New Jersey's elected officials and have their voices heard? I’m far from convinced by everything that gets done today in the name of education reform. But Rhee’s and Brown’s examples are indicative of a troubling pattern for reform opponents: anti-reformers are prone to shooting any reform messenger. Anti-reform has an ad hominem problem. In part this is because the anti-reform crowd is obsessed with who has standing to participate in education debates. Non-teachers don't count (unless they're Diane Ravitch). Parents’ voices are only permitted so long as they avoid direct challenges to failing schools. 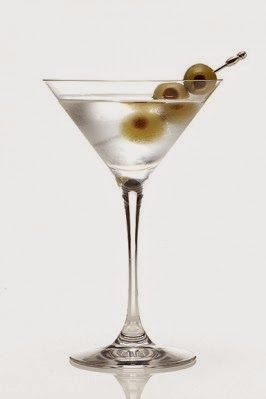 Today's vin de la maison is served by Conor P. Williams, a guy who sells charter school miracles that are, in reality, little better than cheap card tricks. You would think, reading this passage, that our public education debate has been dominated by teachers. You would think, following Williams's construction, that us almighty teachers were bullying out media access for other stakeholders, including folks like Brown, who don't even send their own children to public schools. Conor, here's a challenge: name just one teacher, current or retired, who commands even a fraction of the media coverage of Michelle Rhee or Campbell Brown. Trust me -- you can't. In the mainstream media, Randi Weingarten remains one of the few pundit-approved voices advocating for public education and public school teachers, and even her time is limited (I think Randi does a good job when she's given the chance). Diane Ravitch is a distant second. Williams whines that occasionally people send him intemperate tweets. But maybe folks would be less inclined to hurt Williams's delicate feelings if the current national conversation about education and teacher tenure actually included a few teachers. Maybe if The Daily Beast and Talking Points Memo offered slots to folks like the ones on my blogroll as often as they offered them to Conor P. Williams, teachers wouldn't feel like they needed to raise their voices on social media just to be noticed. When Rhee wrote her book, she got a publicity tour any author would dream of (it didn't help her sales much). Where was a similar tour for teacher-authors like Mercedes Schneider, or José Luis Vilson, or Gary Rubinstein? 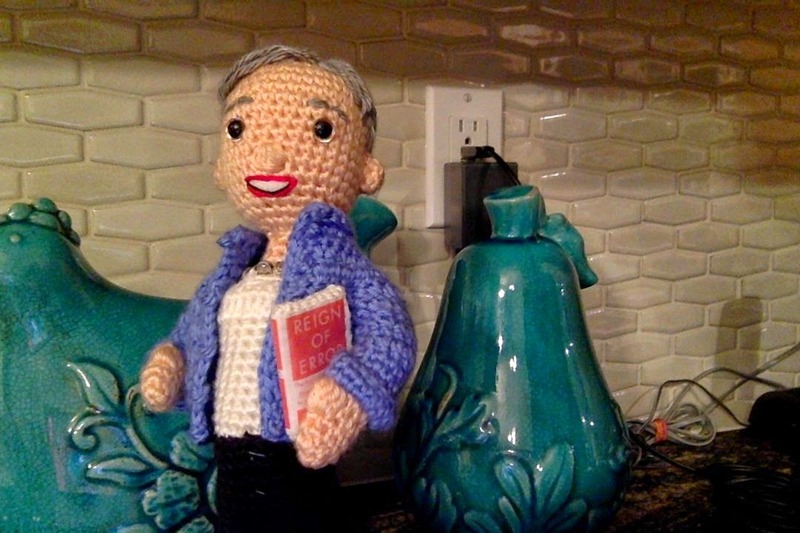 Or, for that matter, Diane Ravitch? Brown has no expertise in education policy, and her arguments are often a particularly crispy form of word salad -- yet she gets prime spots on The Colbert Report and Morning Joe. Who's offering those same slots to teacher-bloggers like Marie Corfield, or Arthur Goldstein, or, Anthony Cody, or -- heaven forbid -- me? Whining that "non-teachers don't count" is beyond ridiculous. The critics of the "reform" movement include many non-teachers: Leonie Haimson, Darcie Cimarusti, and Jennifer Berkshire are just a few of the most prominent. Researchers such as Bruce Baker, Julian Vasquez Heilig, Ed Fuller, and Kevin Welner (among many others) have delivered cogent and powerful critiques of the "reform" agenda. The writers and researchers and advocates who question the "reform" agenda are a widely varying lot, and many aren't teachers. Only someone who willingly chose to ignore the arguments against Rhee's and Brown's positions would ever claim that "non-teachers don't count." Just as Rhee faced ugly rhetoric about her race and gender, Brown’s positions have already been dismissed on account of her looks. And Rhee had an anonymous, union-funded attack site of her own—Rheefirst.com. Yes, Conor, Diane Ravitch once said something that, if you twist it and distort it and take it completely out of context and stand on your head while you read it, might be construed as vaguely sexist. And, yes, there was once a teacher no one has ever heard of who said something racist and deplorable at a protest. But let's be clear: if you really had a solid case against tenure, you'd brush aside these incidents and focus on the real debate. You'd attempt to pick apart the arguments of Baker or Jesse Rothstein or Ravitch or even me, rather than wasting your time searching for the latest excuse to feel like your side had been slighted. Conor, here's my latest piece picking apart David Boies's anti-tenure argument. You want a real debate? Tell me where I'm wrong. Does this look like a sexist to you? I suspect that celebrity lawyer David Boies -- recruited by celebrity education non-expert Campbell Brown to lead the fight against teacher tenure -- has begun to realize he can't possibly win his case against educator due process on the merits. So he's doing what all lawyers do when they find themselves with a dud of a case: obscuring the issue at hand by conflating it with other unrelated matters. We're talking about not just tenure, we're talking about financing of the education system -- what else? Are there are other areas where you think people who are looking to improve the education system in this country could use the courts and the precedent of Brown vs. Board? If you had fiscal equality, and you had promotion and retention on the merits, and you had some family choice, those three things would go a very long ways toward radically improving our education system. I believe we will have initiatives in other states before the New York case is over with. The decision has not been made. First of all, let's point out that David Boies ain't done crap to bring funding equity to New York State, a place that desperately needs it. He's jumped into the reformy fight with Brown and the anti-tenure crowd and left the struggle to establish equity in New York to others. I'm sure these folks would be happy to have a big celebrity like Boies show up on cable TV and promote their cause, but he's just too busy taking away the workplace protections of middle-class workers. Sorry. Second: if you want to establish funding equity, I can't think of a worse way to do so than by expanding charter schools -- especially in the way New York has allowed them to flourish. 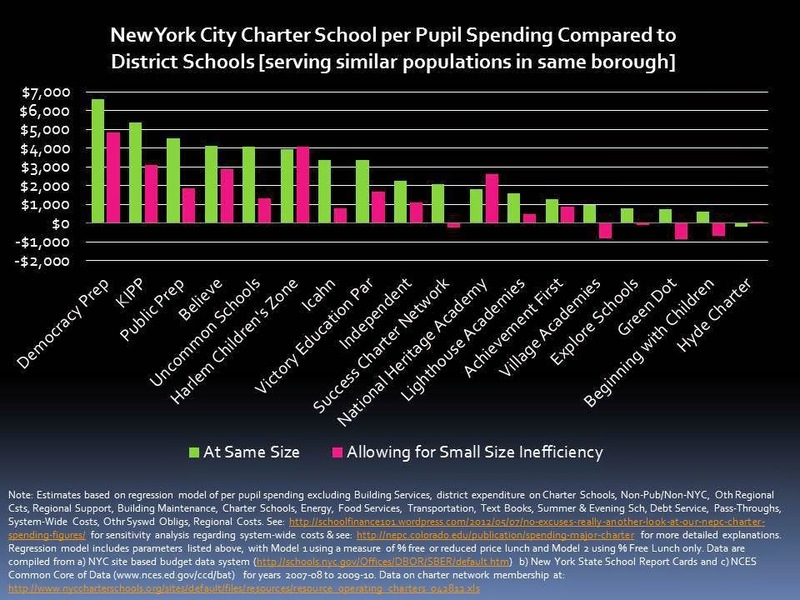 Stealing from Bruce Baker (again) here: many of NYC's charters are getting more money than their neighboring public schools, even when accounting for size inefficiencies. In addition, as we all know, charters serve fewer kids at-risk, fewer kids who are Limited English Proficient, and fewer kids with special education needs. "Choice," as it is currently practiced, is making funding inequities worse, not better. Scarborough (6:20): "So Randi [Weingarten, President of the AFT] says that tenure laws and other job protections are a bulwark against cronyism, patronage, and hiring based on who you know, not what you know." Boies: "We haven't been doing that in our educational system for years. That's not the way you get a job in New York City. It's not the way you get a job teaching in Buffalo, or in Illinois where I grew up. People get jobs based on merit. What we need to do is we need to keep that merit system going while they progress. We do it in every other profession, and we need to do it here." So, in David Boies's world, one day teachers get jobs on merit... another day, they don't. This self-contradiction is so typical of the reformy world. Brown can't even tell us exactly what she wants; all she and Boies know is we have to do something, no matter how destructive it may ultimately turn out to be. I talked to Jesse Rothstein of Berkeley last week. He made two arguments about tenure that I'm hoping you can respond to. He pointed out that staffing in urban schools is often very difficult for reasons unconnected to tenure. Principals may have teachers they don't like very much, but they're worried about dismissing them, because they know that it's an unattractive job. It's emotional stressful. The pay is low compared to what people with a college education make elsewhere. If the point is eliminating teacher tenure will not solve all the problems of inner city schools, he's 100 percent right about that. If he's saying that he thinks the improvement would be a relatively small improvement, I think that doesn't fit with the experience of educators. David, you "think that doesn't fit" with teachers' experience? What evidence do you have to support that belief? Anything? There isn't even any evidence that there would be a "small improvement" -- quite the contrary, in fact. Some of the best performing districts have teacher tenure. Some of the best performing states, such as Massachusetts and New Jersey, have teacher tenure. Where is any evidence at all that gutting tenure would help student achievement? If it exists, I haven't seen it. Rothstein also argued that teacher tenure is attractive to people considering the profession, that people who are in other lines of work where their compensation is based in large part on how they perform, like finance, for example, are paid much better, and that if teachers were no longer protected by tenure, they'd have to be paid more in order to attract the same number of applicants and applicants of the same quality to the profession. As a matter of theoretical economics, everything that affects a person's job can theoretically affect how much money they're going to want for it. But remember, teacher tenure helps the people that are already there and hurts the people that are coming in. You may feel that you would be a really great teacher, and the district would want to keep you, but if they have to lay people off, you're going to get laid off no matter how good you are. 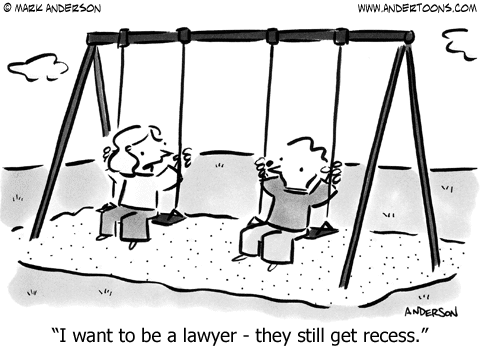 When you come to work for my law firm and you do a really good job, we're not going to lay you off. It is not at all clear to me that teacher tenure is a draw to bring new people into the system. As I have argued here and here, the empirical evidence strongly contradicts Boies's beliefs. No one disputes that teachers gain most in effectiveness within their first few years. Senior teachers consistently show greater effectiveness than novices, and there is evidence that even teachers who are in their fourth decade (!) outperform those in their first few years. I am all for getting rid of bad teachers, and I don't think we should wait for layoffs to do so. But the idea that we can accurately gauge the effectiveness of teachers with a precision that would allow us to supersede the use of seniority is absurd. Further, layoffs don't happen solely on the basis of seniority: programs in the arts, student support services, and other "non-core" staff positions go on the chopping block well before STEM teachers are let go. To believe that schools are afflicted with large numbers of layoffs of great younger teachers to the benefit of older burnouts is to engage in a fantasy. But even if Boies thinks this really is a problem, wouldn't he be better off attacking inequities in funding so that schools wouldn't have to worry about layoffs in the first place? Where are your priorities, David? Second, I think that very rarely do the people who want to become teachers, who are going to be really good teachers, base that decision on whether they will get tenure. While I agree completely that attracting good teachers is difficult, and we need to spend more time doing that -- in part by paying them more money -- I don't think there's any evidence for the idea that somehow tenure attracts good teachers. In fact, I think the evidence is to the contrary. Don't bother clicking the link to find this "evidence"; the link, in fact, will take you to Rothstein's argument against gutting tenure. The truth is that teachers do value tenure. Terry Moe, hardly a friend to teachers unions, says you'd have to pay teachers up to 50 percent more to make up for the loss of tenure. The notion that you could just take away tenure and good teachers will magically appear is ludicrous. But you know what really pisses me off about the assertion here? At the same time Boies tut-tuts about teachers not wanting to be treated like professionals, he suggests that we shouldn't be paid like professionals. He actually thinks he can take away part of our compensation and we'll just nod and smile. If Boies signed an employment contract with a law firm, and that firm later tried to break the contract, you can bet your last dollar David Boies would drag their butts into court. It's really no different here: Boies wants to break the contract teachers made with New York State, and he's not making any guarantees that anything will be offered in exchange for giving up tenure. I called out Jonathan Alter on this a while ago. Reformy folks love to say they want to pay teachers more in exchange for giving up tenure, or instituting merit pay, or removing step guides, or whatever latest scheme they've hatched. But they never, ever say how much more they're willing to pay, and they never, ever say where they plan on getting the money. Well, fellas, I may be a teacher, but I'm not stupid. When you have an actual plan, show it to us -- until then, your promises are as empty as your rhetoric. We went through this in the marriage equality battle, where there were some people who said, "Stick to the legislators." If we had stuck to the legislators, we would not have marriage equality in Pennsylvania or Virginia or Oklahoma or Utah, any of these states. We wouldn't even have it in California. There's a limit to how far you can go legislatively. I applaud Boies's fight for marriage equity, but I very much resent any analogy made between taking away the due process rights of teachers and withholding the right of two people who love each other to get married. Any implication, intentional or otherwise, that the folks like me who are standing up for tenure and the bigots who oppose marriage equity are somehow equivalent rubs me raw. And David, I know this may come as a shock, but guess what? There are plenty of gay and lesbian teachers. Do you think that it's possible that maybe there are some bigoted administrators and school board members out there who would love nothing more than to purge their schools of the "threat" posed by LGBT educators? I suppose you'll happily represent them all for free in court when the time comes, right? So long as Tom Moran, Editorial Page Editor of the Star-Ledger, insists on publishing pieces about education full of omissions and half-truths, I have no choice but to continue to set the record straight and correct him. The core dispute is about race. Whites in Hoboken have fled the district in droves, thanks to its long record of academic failure and racial imbalance. The city is 82 percent white, but all the district elementary schools are majority African-American and Latino. And the dirty secret is that the district itself is aggravating segregation by allowing white families who live near Connors to travel across town and enroll in other schools. The mechanism is a perverse district choice program. In Montclair, parents rank their choices and are enrolled with the goal of achieving racial balance. In Hoboken, choice allows white families to flee from Connors, making segregation worse. He's not giving the full story. 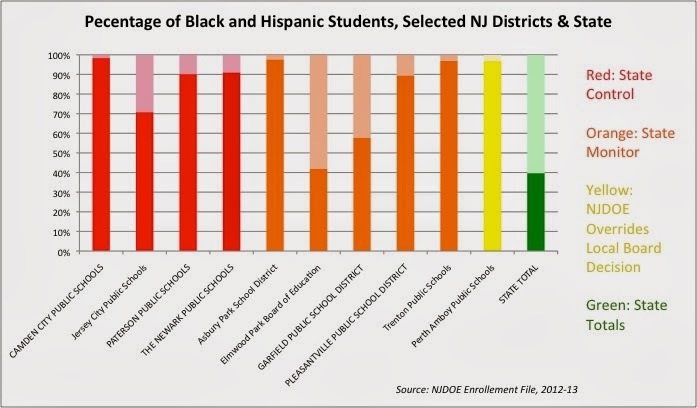 No Hoboken school besides Brandt -- a pre-K/K school and, therefore, not really a relevant comparison -- has as high a proportion of white students as HoLa. If the white parents whose children are in HPS schools are "fleeing" Connors, the same can easily be said of the parents of the charter schools. I've been very careful not to make these sorts of accusations about Hoboken parents, whether they send their children to HPS or the charters. I guess Tom, a professional journalist, has no such qualms. And in the end, they [HoLa] got twice the portion of minority kids as the city’s population. And progress continues. This year’s kindergarten class is 41 percent minority. So ask yourself: Is this the profile of a school that is trying to block out minority kids? First of all, define "minority." If "minority" equals "non-white," then the kindergarten class is carrying on a tradition of HoLa having a 60% white population, which is significantly different from all of the HPS schools. Second: as I explained in my post about the socio-economic segregation found in Hoboken's charter schools, you should not compare the demographics of school-aged children to the demographics of a population that includes adults. I was just in Hoboken last night, and as anyone who has been there can tell you, it is a mecca for young urban hipsters, many of whom don't have children. 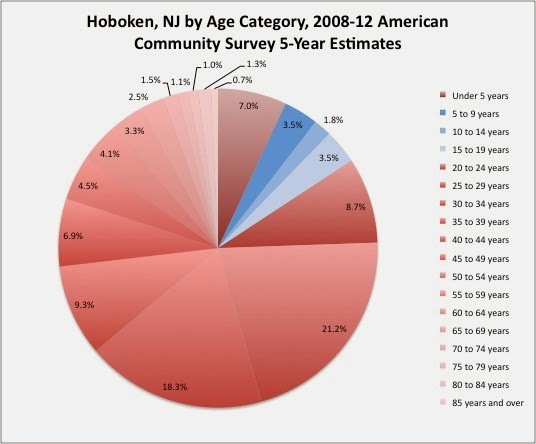 Assuming that you can extrapolate the racial composition of the student population (public, private, and home schooled) of Hoboken by simply looking at the racial composition of all age groups is a rookie mistake. 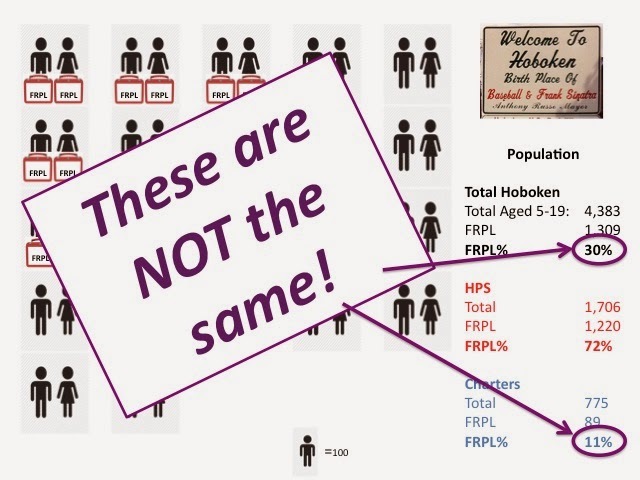 School-aged children only account for 9 percent of the total population of Hoboken -- their racial makeup could be quite different from the entire population's. 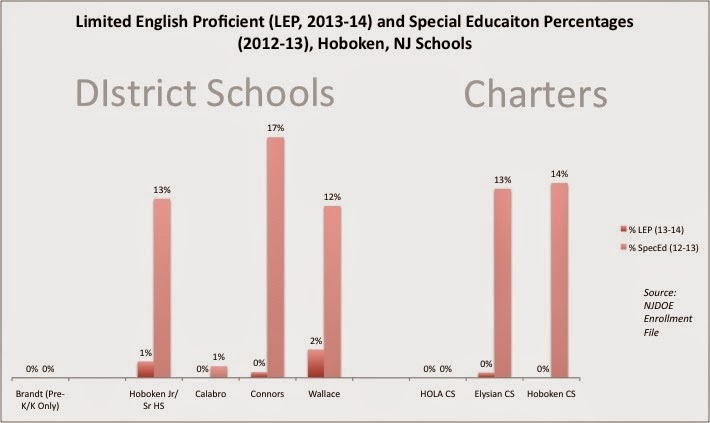 So there's every reason to doubt a comparison between the racial profile of the entire city population -- including adults -- and the racial profile of the Hoboken charters. Unless Moran has data I don't have that includes all of the children of Hoboken without adults, he ought not to make these comparisons. 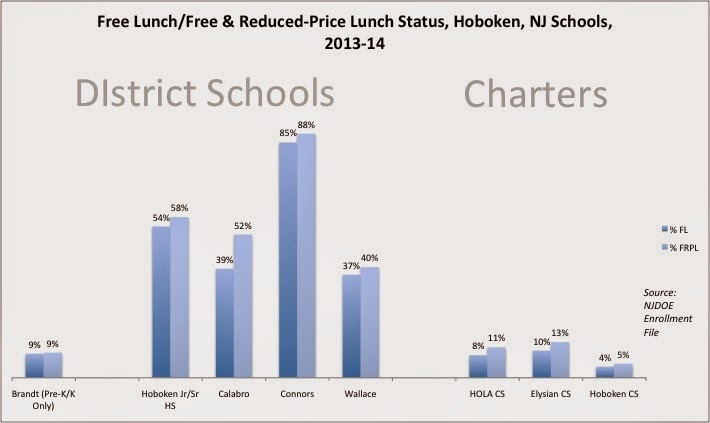 Here are the Free Lunch and Free & Reduced-Price Lunch eligibility numbers for Hoboken's charters. There's no doubt that Connors has many more students in economic disadvantage than HPS's other schools. 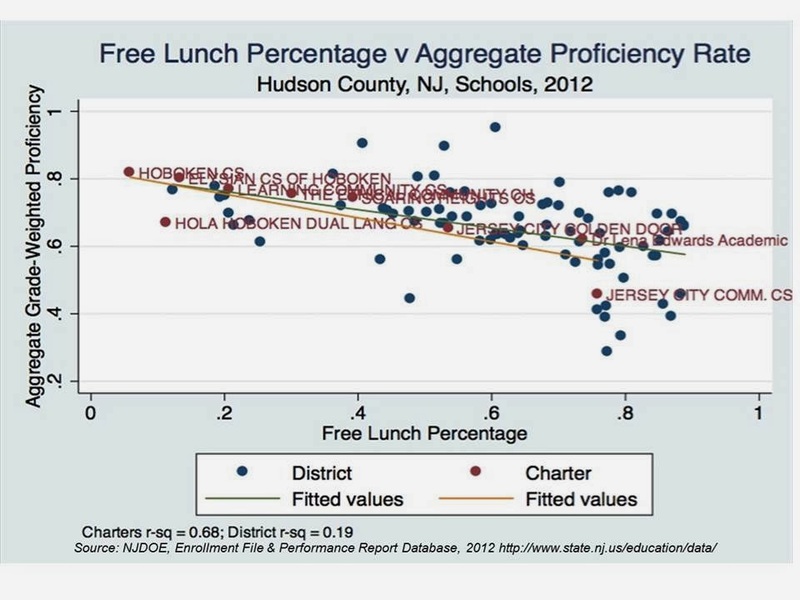 But there is also no doubt Hoboken's charters educate far fewer students in economic disadvantage than any public school in Hoboken (save, again, Brandt). Hoboken has a relatively low Limited English Proficient population; that said, HoLa didn't educate one child who was listed as LEP in 2013-14. I had to go back to 2012-13 for special education data: NJDOE reports HoLa had 0.0% special education students that year, and 0.6% in 2011-12. This is school-level data*; district data puts HoLa at 4.47% (honestly, I don't know why there is a disparity, especially because NJ considers a charter school to be its own district). You might look at this and think: "Well, HoLa isn't taking it's fair share of kids with special needs, but the other charters are doing OK."
An SLD is a "specific learning disability." SPL is a speech or language impairment. These eligibilities, while certainly deserving of services, are the less costly categories of placements. The plain truth is that HPS is not only taking more children with special education needs than their neighboring charters; they are taking more children with the costlier needs. You simply can't make the relative comparisons that Moran does about charter school budgets without addressing these fundamental facts. When Moran says race is the "core issue," not only is he providing an incorrect context for assessing the state of Hoboken's charters -- he's ignoring issues that are at least as "core" to the charter school discussion as race. He's not addressing disparities in economic disadvantage, and he's not addressing disparities in student needs. 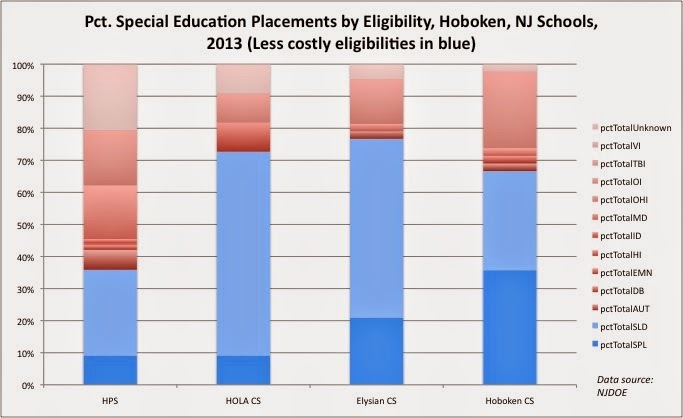 As Bruce Baker has pointed out, Hoboken's charter sector displays some of the greatest economic disproportionality of any community in New Jersey, let alone the country. Where is Moran's concern about this? And their [HoLa's] test scores are rocking: They are in the top quarter of academic achievement in New Jersey, according to the state, and the top 1 percent when measured against peers of the same demographic. So, what, exactly is the problem? As Julia Sass Rubin has pointed out, the state's "Performance Reports" are highly questionable measures of student achievement; the precise methodology for creating the "peer groups" remains hidden, so we don't really know how it works. When you compare HoLa to the rest of Hudson County's schools, you find that its proficiency rates are below what you would expect for a school with so few students in poverty. The rest of the county's charters don't do much better. In fact, many traditional public schools get results just as good or better than HoLa, yet serve many more students in economic disadvantage. Certainly, there is no evidence within the NJDOE data to show that charters in Hoboken and Jersey City are engaging in a deliberate pattern of cream-skimming. That same data, however, is quite clear: the charter schools in Hudson County that have higher rates of proficiency and/or student growth do not serve the same percentage of economically disadvantaged students as their neighboring traditional public schools. 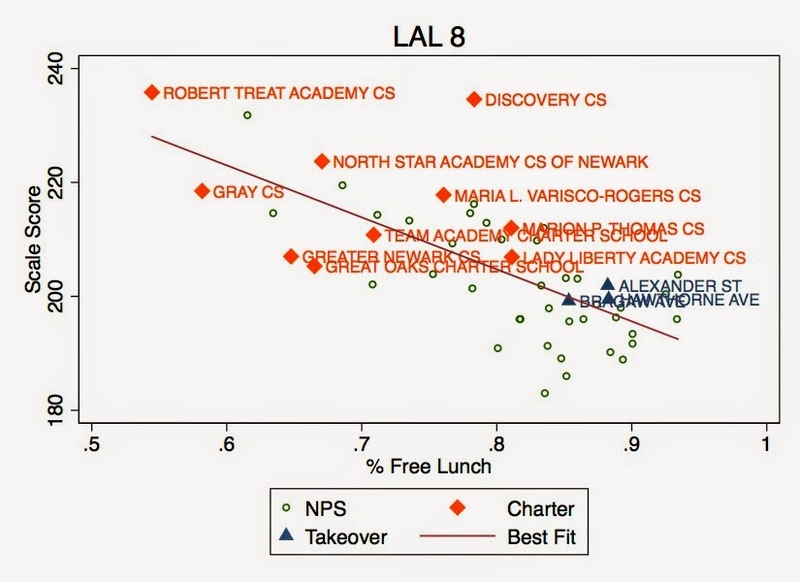 Further, there is a clear correlation between these charter schools’ test outcomes and the relative percentage of free lunch students they serve compared to their neighboring TPSs. The correlation is much stronger for the county’s charter schools than its TPSs. Are cream-skimming charters a good investment if their test score outcomes correlate closely with their disparity in serving economically disadvantaged children? This is, of course, a question Tom Moran will never ask. He'll fret about "tone" and he'll accuse people like me of saying things we never said. But he will never, ever ask himself the hard questions about education policy in New Jersey. The Star-Ledger Editorial Board meets, once again, to discuss education. To those who press the demographic contrast between hola and district: No one disputes there is an imbalance that's a problem. The question is what the answer is. Wouldn't it make sense to allow Hola to use preferences in its lotteries? And wouldn't it be a travesty to halt the expansion of a school that is so obviously doing well by its kids, one that hundreds of Hoboken families want to enroll in? If HoLa or any other charter is "obviously doing well by its kids" by serving a different student population, it logically follows that what they are doing is not replicable on a larger scale. You can't make every school in Hoboken have a proportion of its students in economic disadvantage that is less than average -- this ain't Lake Wobegon. Somebody has to educate the free lunch kids. Somebody has to educate the LEP kids. Somebody has to educate the special eduction kids, especially the ones with the most costly needs. You say you want to put more of those kids into the charters. But all indications are that when you do, the charters will not have performed as well as the public schools. Look at this again -- seriously, really look at it. I used one aggregate measure here; we could use a bunch more, but I'm telling you we'd pretty much see the same thing. Yes, HoLa has a decent aggregate proficiency rate; good for them! But they serve far fewer kids in economic disadvantage than the other schools. Their outcomes are actually below what we'd predict. I would never say they are a "bad" school for not precisely following this trend. But I will point out there are many public schools that do as well or better than HoLa on test-based outcomes even though they serve a much greater proportion of at-risk children. This is not rocket science; if it were, I couldn't do it. This is really, really basic stuff. Why don't you understand it? * I have this data as part of an OPRA request; it isn't available publicly in a database, even though you can find it in the school performance reports. Weird, huh?